A Timeless Treasure and Style Classic, our rings are always fit for any occasion. 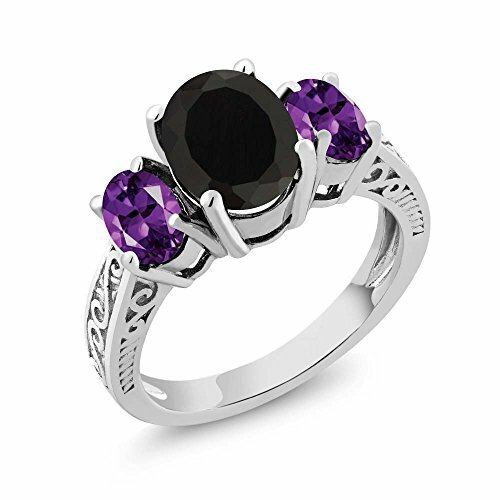 Beautifully crafted and designed our Onyx and Amethyst ring is sure to win your way into her heart. This ring crafted in 925 Sterling Silver that adds a polished look to any ensemble and outfit. This ring is the perfect ring for engagements, weddings and all other occasions. As always with all of our products this item comes in packaging making it ready for gifting as soon as it is received.This beautiful item is brand new and comes with complimentary gift packaging appropriately selected to match the item you purchased. The packaging ranges from dainty foam insert packaging to luxurious leather insert cherry wood boxes. Every order is fully insured regardless of value. This insurance protects you against damage or the loss of your item while in transit. The Shipping and Handling fees include the insurance so there is no need to pay separately for insurance. MADE OF REAL SOLID 925 STERLING SILVER - This Ring is made of solid 925 sterling silver, with 925 Stamp. This composition makes this ring extremely tough making it suitable for everyday use. Every piece passes rigorous inspection. So you can buy with confidence. This ring is perfect for professing your affections for that special someone or as a just "Thinking of you" gift. It can be worn with any outfit and is a truly gorgeous addition to any jewelry collection. CARAT TOTAL WEIGHT - 2.53 CT (This item is proudly custom made in the USA). Center Stone: 9x7 mm, Small Stones: 6x4 mm, Natural Oval Black Onyx & Purple Amethyst Ring (All the sizes displayed are in stock) Crafted in 925 Sterling Silver. This gorgeous ring promises a carefree and comfortable wear. Its design is meant to accentuate the fingers beautifully. This ring is truly a gorgeous piece that deserves a spot in every jewelry collection.